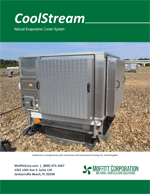 The Moffitt CoolStream system is designed for commercial and industrial applications to cool outdoor supply air 10° to 30°F below ambient utilizing evaporative natural cooling. It is up to 7 times more efficient than conventional air conditioning and in many cases just as effective. The units use direct drive variable speed motors to reduce maintenance while increasing efficiency. Each is constructed of aluminum to reduce weight and eliminate corrosion without compromising durability. Learn more about Hybrid Ventilation in our blog post here. Roof or wall mounting available. “All Seasons” package is available for roof or wall mount. Draws down warm air from the ceiling in the winter. The CoolStream name is trademark of Colt International Licensing Ltd, UK. The CoolStream is hygienically tested and certified to VDI 6022 for “Hygienic Requirements for Ventilation Systems and Units for Internal Spaces”. The CoolStream is designed for roof or wall mounting. The roof mount configuration is available with an "all-seasons" package to draw down warm air from the ceiling in the winter.